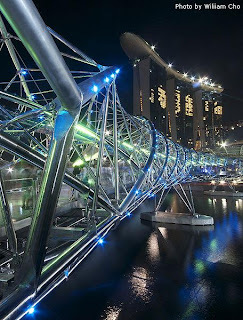 In April of this year, the Helix Bridge which crosses the Singapore River in Singapore’s Marina Bay was completed, signaling a radical achievement in not only bridge architecture, but architectural LED lighting as well. The nearly 1,000ft bridge is modeled after human DNA and features to independent steel frames that spiral around the bridge and are connected to each other by steel struts. Attached to these steel frames are metal canopies to provide shade and house additional design elements and LEDs. Furthermore, the bridge features two pairs of the letters ‘c’, ‘t’, ‘a’, and ‘g’ that represent cytosine, thymine, adenine, and guanine, the building blocks of human DNA. The bridge designers though it important to have these elements represented to further suggest the human form in the bridge’s architecture. The bridge features around 10,000 LED bulbs and custom fixtures, all of which are kept in sync and properly cued up with DMX controllers. The LED lights ensure that the bridge’s lighting can withstand Singapore’s weather while remaining durable and energy efficient. White LEDs were installed to illuminate the bridge’s walkway and colored LEDs were installed on the exterior of the bridge, on the curving metal pieces to highlight the bridge’s radical design. Though we cannot supply you with the radical bridge, BulbAmerica can certainly supply you with a wide variety of indoor and IP65 rated outdoor LED products. Make sure to leave a message or question on our blog or Facebook or call us at 1-877-622-0897.